Original Target for this week was 7h. Had also planned to do the Wentworth50. The highlight of the week (given how little time I’ve spent on the bikes recently) was bizarrely coming off my bike. It was just nice to push well beyond my limits. Thanks to the group I was trying my best to keep up with. While the picture makes it look worse, it was just a little graze. It also good to push the heart rate a bit more on the Sunday ride. It has been a while since I’ve been in these high zones, and it didn’t even feel that bad. The total amount of time is disappointing, but I’m still fit and feel like I can build on this next week. Given I’ve put on half a stone recently, I’m starting to look forward to the large volumes of bike time I’ll be putting in all too soon. Took it nice and easy. Just glad to be back on the bike. It was a bit cold but kept mouth covered up where possible. I dared to put a bit of effort into this ride and it hurts. Can’t say I enjoyed it much but it is at least good to know I’m back on it. Head wind all the way didn’t help. Be a while before I’m back to what I was at New Year. This was my first chance to test out the flat peddles I fitted a while ago to the Prophet. The first set of technical climbs were a challenge, I can see it will take a while to get the same confidence you get being attached to the peddles. In the end I had to drop the saddle, it seems I needed weight on the flat peddles to keep them tight, so the usual XC position of spinning at full leg extension was lost. Made for slow going up the hill. To be fair, lack of fitness and some dodgy gears might have been more to blame. Once I’d stopped trying to jump the old clipped in way, the downhill runs were much more fun. Got caught up in a big group of locals, and managed to keep ahead of them for a while, before tiredness made me lazy with my front wheel and I ended up bailing out onto a nearby bank. 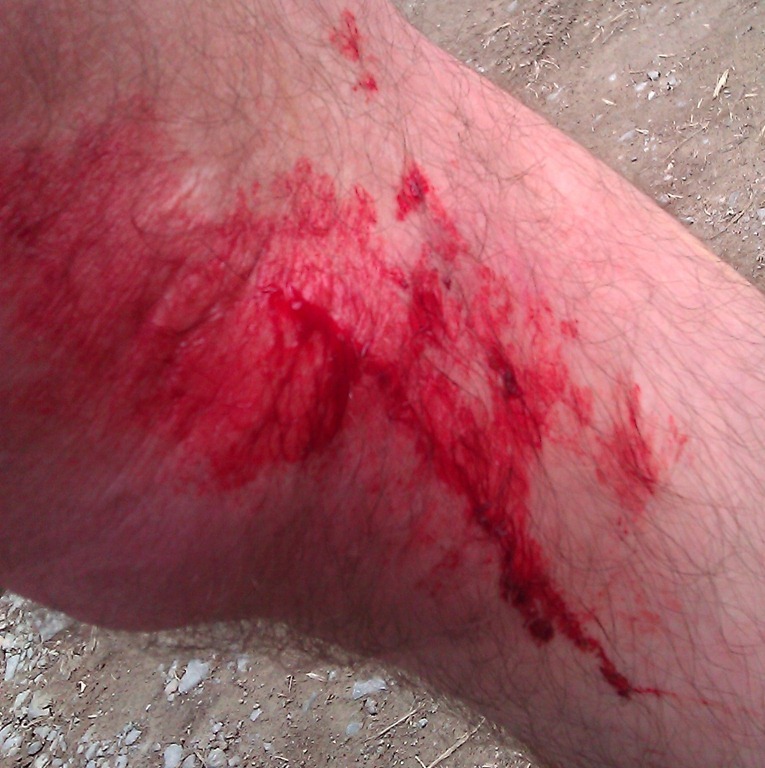 Luckily just a small graze on my knee to show the kids later. Rest of the downhill bits were fun. Finding the flats give me much more of a core workout and I’m sure they will improve my skills as I get more used to them. I contact you on behalf of the Norwegian Museum of Science and Technology in Oslo. We work with a major exhibition on the brain, and in that regard we are looking for nice pictures of various brain metaphors. We like your photograph “Brain tree?” that you have on your flickersite. (http://www.flickr.com/photos/gothandy/339758623/) We would like to explore the possibilities of using your photograph in the exhibition catalog. We’d be very grateful if you could send us an email at the address that I just left here, so maybe we can discuss a possible use of the photograph.